Because several wineries this year released their icon Bordeaux reds around the same time, I assembled nine of these stars for a blind tasting by myself and three wine-loving associates. With the possible exception of Nota Bene, these wines are all available from the wineries and in most VQA wine shops. Nota Bene was released in the spring. However, the Black Hills winery kept some back for sale at the winery (one per customer) during the wine touring season and at $60 a bottle. The wine was included in this tasting because it has such a cult following. We wanted to see how it stacked up against other icons (pretty well). This is not an exhaustive list of B.C.’s icons; no Pinot Noirs were included, for example, because this was not meant to be a Pinot Noir tasting. As well, at these price points, there is an economic reality. Some of the wines were samples from the wineries but others had to be purchased. Because the wines were all reasonably young, every bottle was decanted and then returned immediately to the original bottle. The point was to let the wines breath a little and open up. Consumers need not be in a rush to open any of these wines. They all have the structure to improve in the cellar for at least the next five years. Ideally, icon wines should score 90 points or better. Most of these did and the rest were close enough that time in the bottle just might lift them as well. These are all delicious wines that collectors seek out. They are reviewed here in order of price, with such additional information as the wineries have made available. Surprisingly, a few wineries don’t bother to break out the percentages of each variety in the blend. I would suggest that a buyer of an icon wine wants to know that, especially those who collect vintage after vintage. To its credit, Osoyoos Larose puts the detail right on its front label. Note that Merlot is often the backbone of a blend. This is not just because Merlot is the most widely planted variety in the Okanagan and Similkameen valleys. The terroir there produces Merlot that has structure and firm ripe tannins, a good building block for a red blend. This is the flagship red blend from Herder Winery. This just-released vintage has a slightly raw, youthful edge, with firm tannins, suggesting the wine will benefit from aging in the bottle. The aroma has a note of vanilla and mocha; as it opens in the glass, there are floral aromas as well as dried fruit aromas. The flavour displays vibrant red currant hints. 87 and age-worthy. A re-taste of the second half of the bottle two days later confirmed how aging will help. The wine had rounded out and developed a graceful elegance. Now it scored 89 points and rising. Aged 16 months in 60% new, 40% one-year-old French oak barrels and six months in bottle. 10,000 cases produced. Merlot (57%), Syrah (28%), Cabernet Franc (10%), Cabernet Sauvignon (5%). Cabernet Sauvignon, Cabernet Franc, Merlot, Petit Verdot, Malbec. Aged 18 months in French oak, 18 months in bottle. 364 cases produced. Merlot (56%), Cabernet Franc (21%), Cabernet Sauvignon (18%), Syrah (5%). Fermented in stainless steel, left on the skins for 16 days and aged 25 months in 70% American oak, 30% French oak. 500 cases produced. Merlot, Cabernet Sauvignon. Aged in new American and French oak. 100 cases produced. Merlot (42%), 28% Cabernet Sauvignon, 20% Cabernet Franc, 10% Petit Verdot. Fermented in small French oak vats, aged in French oak for 13 months. Fruit harvested at just over one ton an acre. 250 cases produced. A retasting of the second half of the bottle two days later showed that the wine had become more generous in structure; and delicious flavours of blackberry and plum jam had begun to emerge. This is an easy wine to like, even if contentious in the original tasting. Robert Van Westen’s wine releases are out of synch with his peers. Most other wineries tend to release their white wines in spring. Robert, the co-owner and winemaker at Van Westen Vineyards, waits until late fall – when most of the competing good whites have disappeared from wine store shelves. He has now released his three 2007 whites. What a triumph in winemaking they represent. The only complaint is that the quantities are limited; buyers need to move quickly to find these wines before they, too, have disappeared from wine stores and restaurant lists. There are the best white wines so far from this small Naramata Bench winery, which has been open three years now. Next year, Rob and Tammi, his wife, will be opening the winery’s first tasting room, making it easier to find the wines. A word of warning: call ahead because the tasting room is likely to be open only n Tuesdays and Saturdays. 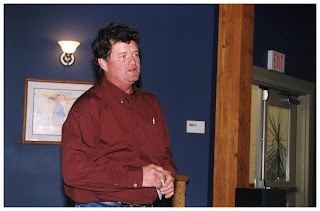 Since opening Fairview Cellars in 2000, Bill has made his reputation primarily with the Bordeaux reds – Cabernet Sauvignon, Cabernet Franc and Merlot – with a little bit of Syrah and Sauvignon Blanc. There was a very simple reason why he made those wines. “I am only a Cab man because that is what grows well on the property I have,” he says. His 2.4-hectare vineyard is on a sunny promontory at the start of The Golden Mile, not far from Oliver. “I figured I better get some experience with the grape,” he adds, explaining why he made his first Pinot Noir this vintage. “I don't know if I will release this wine, or hold it until I have some from my own grapes. If he does release this wine, look for it in about 18 months.